Minimalist style with a hint of traditional structure - that's the Happy Beds Suffolk White Bed! This beautiful wooden bed is crafted from high-quality pine wood and veneer, and features a durable, modern white finish. 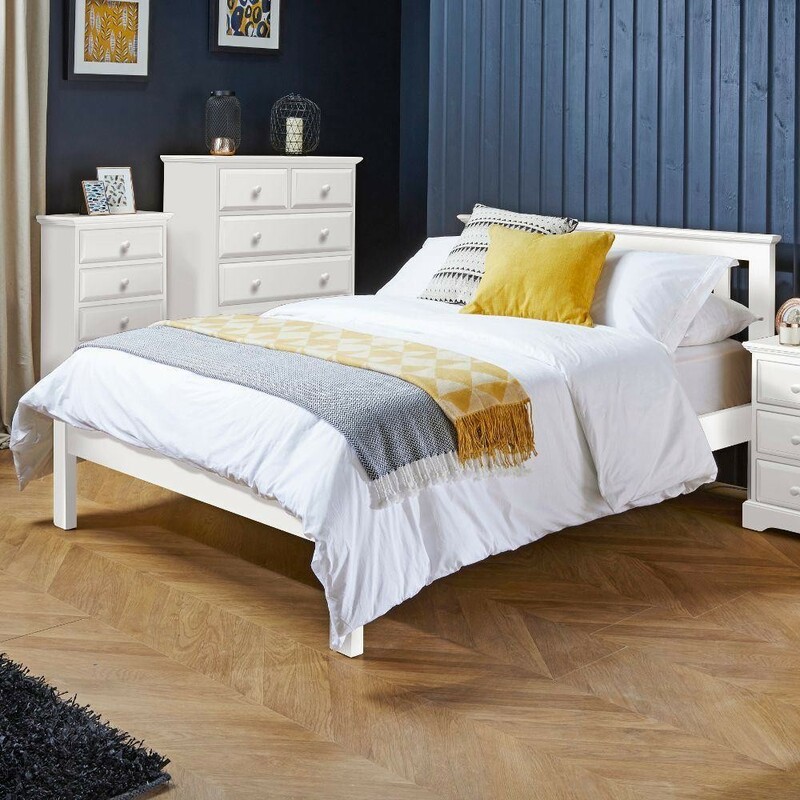 This adaptable bed also gives you functionality and comfort, due to the large underbed area which is ideal for storage, and the solid slatted base which supports you whilst you sleep. With its straight-edged, pine structure, the Suffolk Bed has that classic bed frame feel. However, the white finish gives the Suffolk an added feel of contemporary minimalism. The white colour also has the added benefit of being able to go with any other colour, and so this bed looks perfect amongst any kind of bedroom decor designs and styles! The overall design of the bed gives a feeling of spaciousness, which makes the Suffolk especially ideal for smaller bedrooms! The space underneath the Suffolk is perfect for those with too much clutter! You can either store large items out of the way underneath the bed, or put some storage boxes, baskets, or drawers underneath to organise smaller bits and bobs you can't find a home for! Minimalist design, indeed! The Suffolk Bed is focused on your sleeping comfort, and features a solid slatted base for support and added mattress bounce. Solid slats also allow air to circulate around the mattress to help it stay and dry, which will help to prolong mattress life! The product is part of the Suffolk White Wooden Bedroom Furniture Collection.